Florida Agriculture in the Classroom (FAITC) moved their annual Agriculture Literacy Day to the fall this year, and the new date is Tuesday, November 13, 2018. 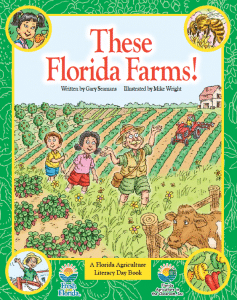 Agriculture Literacy Day this year will be using the book, “These Florida Farms!” That is the 2008-2009 book, and they invite Florida agriculture industry volunteers to find an elementary school near them. Florida Department of Agriculture and Consumer Services employees, University of Florida IFAS Extension Agents, 4-H Agents and Master Gardeners, Florida Farm Bureau members, Florida Cattlemen and Cattlewomen members, FFA teachers, students and other agriculture industry representatives will be taking part in the readings this year.